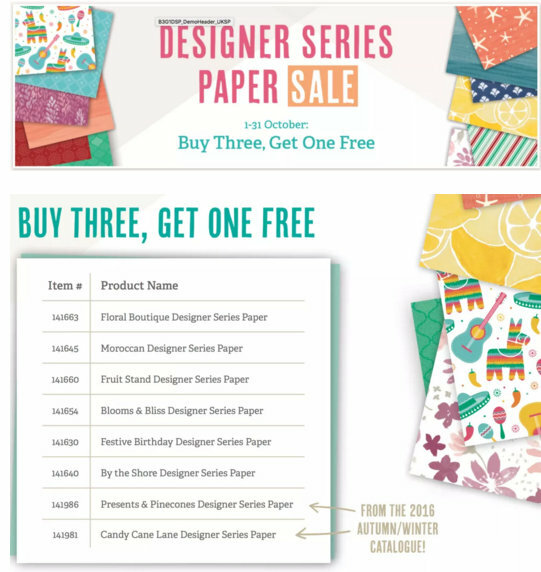 Fast Friday #30 - Special Reason by Stampin' Up! I know it's been a long time since I have done a Fast Friday post, but thought I would share these quick but effective cards. 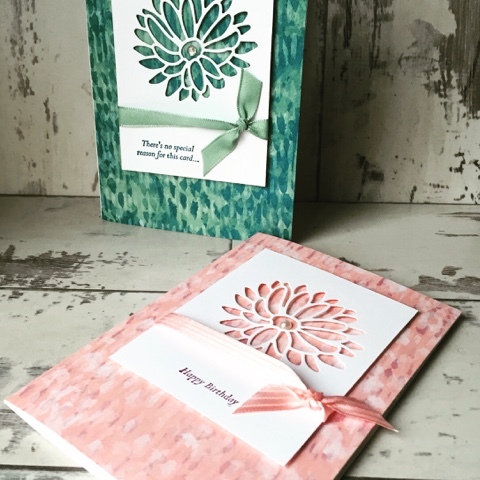 Both versions use the versatile Blooms & Bliss DSP as well as the Special Reason stamp set (20% discount on the clear mount) and coordinating framelits dies Stylish Stems (40% discount). All 3 of these as well as the ribbon used is on the Retiring List. Some of the stocks are low but at the time of posting are still available - so grab these quick before they sell out! You can order from my online shop 24/7 or if you prefer contact me directly. Don't forget to enter the code V4MFA49 during the month of April 2017 if shopping online and you will receive a free gift from me (learn more). So get them BEFORE they sell out as they will be gone FOREVER. Items from both the Annual Catalogue and the Spring/Summer Seasonal Catalogue which will NOT be carried over are shown on the lists above. In previous years I have had many customers that have missed out on retiring products and they were kicking themselves that they didn't get their favourite retiring items quickly enough! So don't delay - SHOP TODAY! The quickest way to order is via my online shop 24/7. and you will receive a free gift from me (learn more). Please note if any of the items you would like give you a backordered notice that means there is more stock expected into the warehouse and that your order will likely be fulfilled. If you enter the code and you get a notification that this item has been discontinued and cannot be added to your order that means this item has sold out and is no longer available. Some of the items are being reconfigured so if you see the basic rhinestones for example this does not mean that we will no longer be selling rhinestones, it just means they have been repackaged and will be offered in a different configuration. Finally it is a wonderful time to join, you can add any current items to your starter kit including retired and discounted products. You pay £99 and you can choose £130 worth of any products and you get to see the brand new catalogue coming in June and an even better perk, demonstrators get to pre-order some of the new products in May! Click the ‘Join my Team’ tab above for more information. 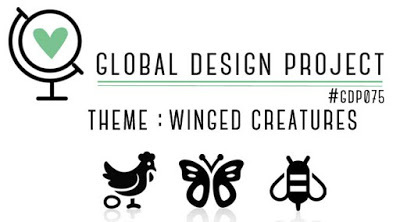 I'm taking part in the Global Design Project for the first time and in my usual style I'm leaving it until the last few hours to submit my entry! 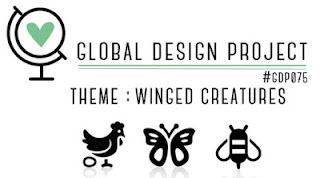 This week's theme is Winged Creatures. Although I've used the Dragonfly Dreams stamp set, I've actually used the bee image. I stamped the bee image twice - firstly with Tuxedo Black Memento ink onto Whisper White card and then secondly onto vellum with Black Stazon. I coloured in the cardstock stamped bee with a Crushed Curry marker and cut out the body. I then attached the vellum wings that I had stamped onto vellum and used the clear Wink of Stella pen to give some shimmer to the wings. Once this was complete the rest of the card came together quite easily. Enter the code YW2B6QPU during the month of February 2017 when shopping online and you will receive a free gift from me (learn more). And don't forget it's Sale-a-bration time - so for every £45 (excluding P&P) that you spend you can choose a free product from the Sale-a-Bration catalogue up until 31 March 2017. Stampin' Up! have the sale of the century starting today and it’s going to last a week! 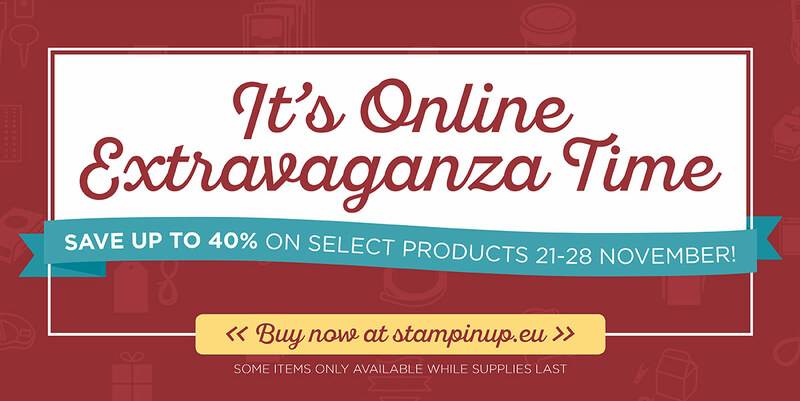 Some items are up to 40% off - wow! There are also 24 hour flash sales for the first day (today 21 November) and the last day (28 November)! Don’t forget though, this will be a ‘while stocks last’ sale, so please don’t miss out. Some of the items will be retiring from the Winter Catalogue, so when they’re gone, they're gone…. Remember to enter the code MJK6KADK during this month and you will receive a free gift from me (learn more). You will need to hurry to grab your bargains! 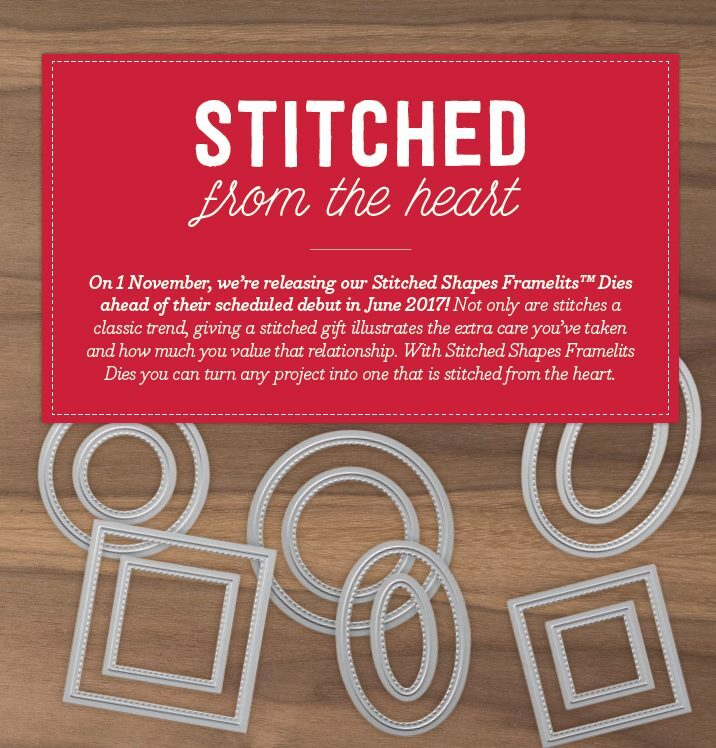 Stitched Shapes Framelits - NEW from Stampin' Up! One of the perks of being a demonstrator is that you get to order product earlier than everyone else, but today customers are getting a sneak peak and can order a new product that will be coming in the Annual Catalogue in June 2017! Want to know more? Read on!! These are framelit dies which create a stitching effect around a shape. What's even more wonderful is that the die set has multiple shaped dies (12 in total) in one set which coordinate with several of our stamp sets. 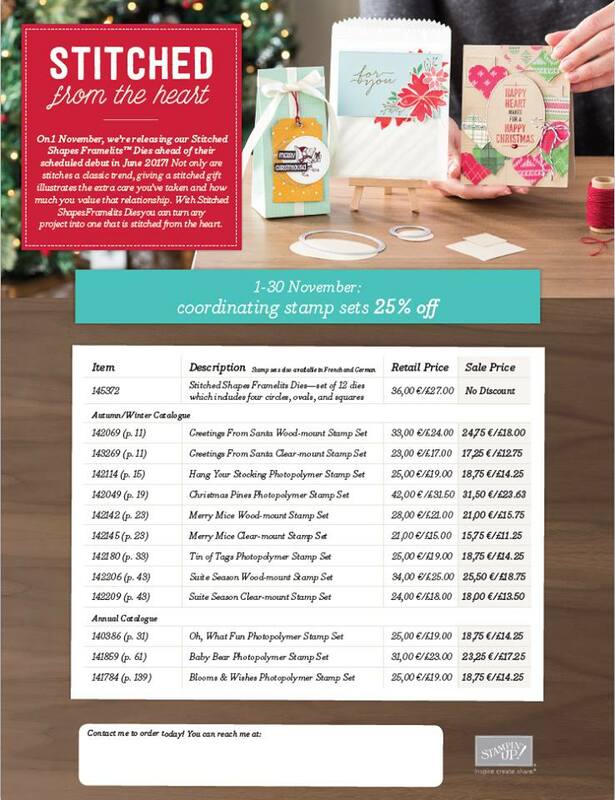 And even better you can purchase the coordinating stamps during November for 25% discount! And here's a close up of the dies. What's not to like?! So make the most of this offer and grab a bargain and be ahead of the crowd. I can't wait to get mine! Enter the code MJK6KADK during November if shopping online and you will receive a free gift from me (learn more). 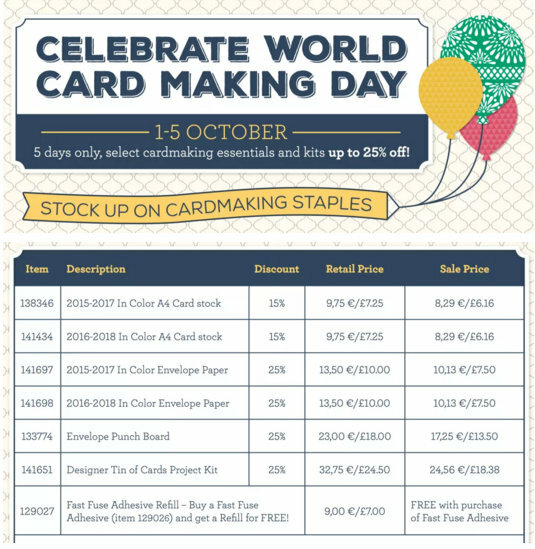 Happy World Card Making Day 2016! Get them before it is too late and make sure you stock up on Fast Fuse - what an offer a free refill! Enter the code B7U46UJS if shopping online and you will receive a free gift from me (learn more). Thank you for joining us on another Pinkies Blog Hop! We're showcasing lots of gorgeous projects using products from the new Stampin' Up!® Seasonal Autumn Winter Catalogue. Simply use the buttons at the end of each post to keep hopping! Welcome to those who have joined me from Sarah's blog - wasn't her project gorgeous? I just love how she has used the new products from Stampin' Up! 's new seasonal catalogue which runs until the end of the year. One of the first products I feel immediately in love with was the gorgeous and versatile Candy Cane Lane Designer Series Paper. I particularly love the sheet with the gingerbread houses and could not resist using this as the basis for my project – a 3D shadow box card. After cutting out the gingerbread house image, I have used crumb cake cardstock as the background to the shadow box – having first embossed it with the Falling Softly embossing folder and using the chalk marker on the embossed image, so it looks like snow falling. I finished off the edges of the card using images cut from other sheets of the DSP. If you want to know how to make a shadow box card, you will find lots of tutorials on YouTube. You can order from my online shop 24/7 or if you prefer contact me directly. Why not contact me and I’ll send you a free copy of the seasonal catalogue. Click to see the products you could earn for FREE! Addicted to papercrafting and France. I am also an Independent Stampin' Up! demonstrator for Bedfordshire. Followers ... I Would Love it if You Followed Me! 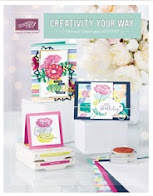 This is my personal blog and is not endorsed by Stampin' Up! I hope you will find inspiration here and am happy for you to CASE anything, but (pretty) please don't copy my designs for publication or contest submissions! Merci! If you are interested in purchasing any of my handmade items (including placing custom orders) as well as any Stampin' Up! orders, please contact me by email. 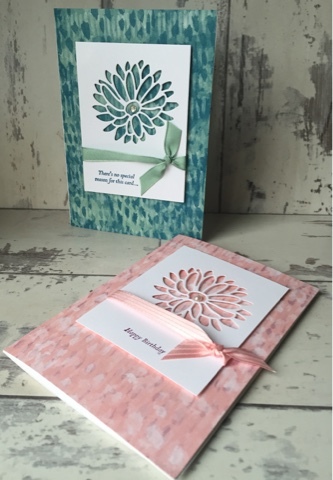 All profits from cards sold will go to The Eve Appeal which was set up to save women's lives by funding groundbreaking research into gynaecological cancers. They have particular emphasis on ovarian cancer.